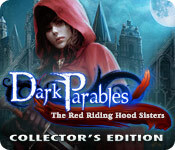 Dark Parables: The Red Riding Hood Sisters Collector's Edition is rated 4.6 out of 5 by 260. Rated 5 out of 5 by AforAllie from A beautiful game This game is fun just to play. The hidden object scenes are beautiful. The artwork is gorgeous. Good story. I wish there were more games like this one. The bonus chapter is worthwhile. This might be the best game of the Dark Parables series. Rated 5 out of 5 by Boomer1097 from Excellent Game I really enjoyed playing this game. This is the fourth in the Dark Parables series and you play as the detective. The story is excellent and the graphics are really nice. I enjoyed the FROGs and mini games. The voice overs were well done and the cut scenes added to the story. There are collectibles that open parables. There are morphing objects to collect. The bonus material includes the mini games, parables, wallpaper, cut scenes and music. there is a built in SG, but I only used it a couple times. The story had a satisfying ending. The bonus chapter gave more of the back story. I'm looking forward to playing the next game in the series. Rated 5 out of 5 by John_Canfield from "Off the Hoo-oo-oo-ook!" This is without doubt one of the finest entries in the "Dark Parables" series. It didn't take long to get me invested in the characters. The puzzles are challenging and fun, the game play sensible, and the storyline is fascinating. Keep it up! Instant Wish-list member. Rated 5 out of 5 by hollyjh from love this game I really love this one. It's beautiful and the story is really good. Another great game from Blue Tea. Rated 5 out of 5 by emerance from Not a word list in sight!! I absolutely love HOGs that don't use word lists! For the HOS, you get three sets of objects that you have to find. As you finish each set, a third of the object is built. Once you finish all, you get the finished object. The story line is really good, sort of like revenge of red riding hood. Eventually, good triumphs, of course, but it's fun getting to that point. Morphing objects and extra chapter in CE, as well as a couple of bonus games. I wish there were more HOGs like this! Rated 5 out of 5 by EvilPrincess1426 from Another great game. Just another great game. I absolutely love this series. I love the visuals. It seems to me every game gets a bit better in the visual department, but they still manage to keep it beautiful, and while realistic, it's still fairy tale esque. Rated 5 out of 5 by pennmom36 from Dark Parables: The Red Riding Hood Sisters CE Wearing her favorite red riding hood, Isabella was on her way to see her grandmother, but fate wouldn't be kind to Isabella, a wolf with glowing red eyes and snarling teeth had just taken her grandmother's life and would have killed her as well if a hunter hadn't saved her life! This same hunter adopted Isabella now that her family was gone, and taught her how to hunt these vicious wolves led by the evil Wolf Queen. Eventually, the hunter himself was killed by a wolf, and once again Isabella was alone.She vowed to protect the weak and innocent, forming the Red Riding Hood Sisters Order. This brave group of women, Theresa, Eldra, Ruth, Jessica and Rose, were mentored by Isabella and became skillful warriors. The Queen has evil plans in the making, and has ransacked their order, imprisoning all of the sisters but one, and she has a dire warning for you Detective, when the full moon rises, her legion of mist wolves will rise to attack and consume everything that stands in their way! 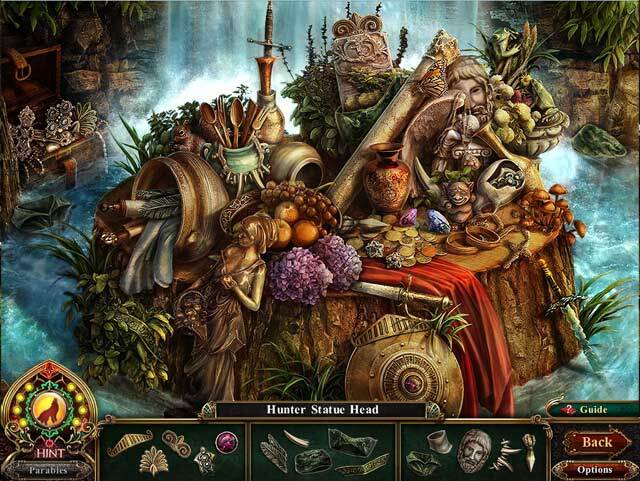 Dark Parables is famous for the unique Hidden Object Scenes that are in the form of fragmented pieces. Most of the fragments are very well hidden or blended into the scenes and when you find all of the fragments for three different sections, the fragments will combine together to make a single inventory item. 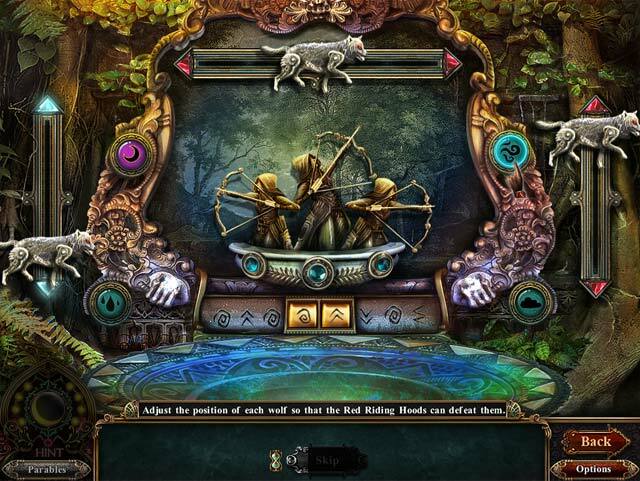 The mini games are unique as well, most are interactive scenes requiring you to interact with buttons and gadgets in order to complete the puzzle such as positioning three different wolves correctly so that when the sisters shoot their arrows, the arrow will directly hit the wolf. This Collectors Edition has the usual extras, Music, Concept art, Wallpapers, Puzzles a built in Strategy Guide, and a bonus chapter, The Boy Who Cried Wolf. As with all the Dark Parables games you collect parables throughout the game which will unlock a short parable story, and there are usually 4 or 5 collectibles for each story. The feature I love in the Dark Parable games are the morphing objects, and they are so well done. There are 20 different morphing objects, so that means that not every scene will have a morph. Not all objects will be activated when you first see them, some objects don't morph until a certain action has been done, some items won't morph until you reach a certain chapter, so you will need to return to previous scenes and search for the morphing objects from time to time. All of the games in this series are top notch and I highly recommend the Collectors Edition because of the morphing objects, enjoy! Rated 5 out of 5 by BabuskaSargus from Great game I really enjoyed everything about this game. 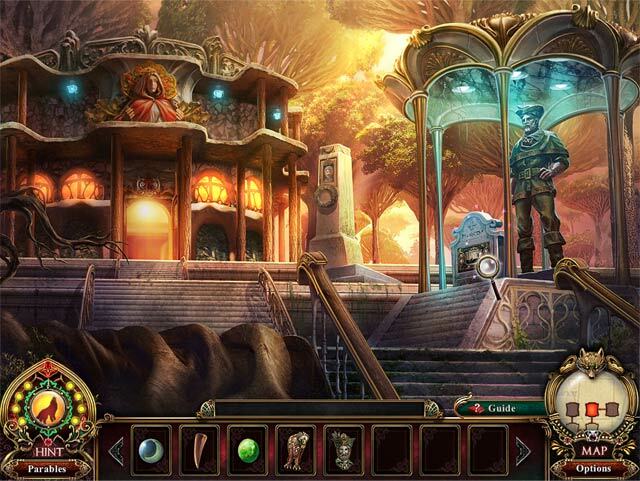 Beautiful and imaginative graphics, good music, the storyline was meaningful, hidden objects interestingly done. Difficulty right. I did not need hint (I played: normal), but the game did not seem too simple. The game flowed nicely. I appreciate the end: no sudden cut as often, but culminated in the grand finale. The allusions to other stories from the series (though unknown) were funny and unobtrusive. It was a pleasant time. Rated 5 out of 5 by Hazumu from My favourite Dark Parables game.Love it!! I love this game,beautiful graphics and sound. You play again as a detective to assist the red riding hood sisters, The characters are charismatic and pretty :). BUT, it was a bit short, i hoped it a bit longer, with more scenes. That's the negative point because they could had done it more extense and i got the feeling they were in a hurry to finish the game asap. So if you're a fan of red riding hood like me, then buy the CE. if not, take the SE. Up to you, but one thing is for sure, you will enjoy it! !